LOS ANGELES, CA (via Pera Padala)) – Don’t look now but Filipino boxing sensation Manny Pacquiao might have ended abruptly the career of a budding fighter whose nose he broke in a sparring session a little over a week ago. Willie Price a huge 6-foot-3 160-pound middleweight volunteered as walk in sparring partner of the seven-division champion, but ended up instead in a clinic here he was treated for a busted nose before going back home to his hometown Detroit in Michigan. “Manny broke his nose so we sent him home after getting medical treatment here,” Pacquiao’s chief trainer Freddie Roach, who could not even remember the guy’s name who, he added was recommended to him by a member of his training coaches at his Wild Card Gym. “He was big at 6-feet plus who has an impressive record in his young pro-career. He said he needs help to pursue his boxing career and at the same time assist us here, especially in Manny’s preparation for his coming fight,” Roach told the Manila Times in an interview. The four-time “Trainer of the Year”awardee said the incident actually led him and his staff to believe that the reigning World Boxing Organization welterweight titleholder has regained his fighting form in his preparation for his coming World Boxing Council super-welterweight tiff against Mexican Antonio Margarito. “Yeah, his performance against that big middleweight proved that there’s no longer any reason for us to worry about Manny’s condition,” Roach said. “I pity the guy, a black American guy who just wanted to help and be helped. Instead, he went home with a dislocated nose apart from depriving himself of earning a little as one of Manny’s sparring partner,” he lamented. “The good thing is the incident opened the door for us to move on with our training. Leave the issue of physical conditioning a bit and concentrate on the last stage of our preparations, which is strategy and game plan,” Roach said. “Now we’ll do the refining on how Manny will knockout Margarito, which, at this stage, we know he is capable of doing,” he assured. To which the 31-year-old Pacquiao, who will try to further etched his name in boxing’s history book by claiming an eighth title in as many weight class against the “Tijuana Tornado” Nov. 13 in Dallas Cowboys Stadium in Arlington, Texas, concurred. “I’m ready,” Pacquiao firmly said after sparring for nine rounds with regular sparring mates Thursday (Friday in Manila) at the Roach-owned gym at the heart of Hollywood here. “I’m almost there and if the fight is gonna be held this weekend, I’ll be 100 percent okay,” he said while signing autographs for his adoring fans inside his favorite Thai Food Restaurant just in front of the Roach-owned sweat shop. 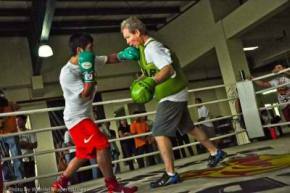 Pacquiao had actually completed the target 120 rounds of sparring that started in Baguio City in the second week of his one-month preparation in the country. But still he scheduled a few more nine more rounds on Saturday and Sunday flying to Arlington. “Like his promise to his countrymen, he also told me not to worry because he will not fail me. And that, of course, made me happy. I can now sleep well starting tonight,” he said.